3d Printing St Pancras gets started! So after many trial runs and testing different printer settings, shape extrusions and really trying to understand the boundaries of what the 3d Printer can do and the accuracies involved and the trials and tribulations of support material I finally got a chance to do a week’s run on the printing and here is the output. Why a week, well at this detail it can take 6 hours plus for a set of 4 walls or even 18 hours for some of the clock tower detail. These are really just prototype pieces, there is a brick shape that isn’t really an accurate representation and some refinements in detail I’m going to make. Here’s some pictures to show some progress and the actual printer itself. 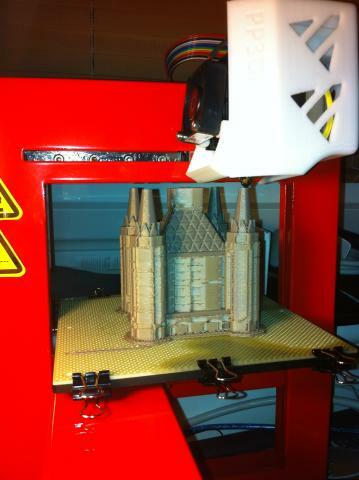 This entry was posted in 2mm finescale, 3d Printing, St Pancras and tagged 3d modelling, 3d printing, st pancras. An £80 Mesh Network Camera for Conservation?